This post DOES NOT contain spoilers for Split, but it does have spoilers for The Visit. McAvoy as the alter "Hedwig." A grown man, speaking and acting like an oversexed nine-year-old boy while dancing spasmodically to Kanye West albums for the girl he’s just kidnapped. A mentally ill nursing home escapee, her mouth covered in powdered sugar, screaming “Yahtzee!” at two terrified children. A second mentally ill nursing home escapee, rubbing a dirtied diaper in a child’s face, claiming cheerfully that it’ll help him get over his fear of germs. These are just a few of the most darkly humorous moments I’ve had the pleasure (and discomfort) of enduring while watching M. Night Shyamalan’s films Split and The Visit. If nothing else, you have to give the man credit for absolutely nailing the black humor in his two latest films. Specifically, the impeccable way Shyamalan manages to blend a near-constant sense of creeping dread and horror with some of the funniest, darkest humor I’ve seen in a while. Because it wasn’t always this way. Deschanel's wide-eyed sense of weirdness pervaded The Happening, to its detriment. Does anyone remember The Happening? 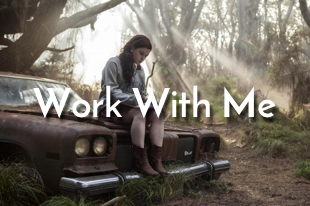 In which Mark Wahlberg and Zooey Deschanel (odd casting to begin with) spent an entire film trying to outrun plants that made people suicidal. The film had some scary moments – an old woman cracking her head through multiple windows before dying is a particularly memorable one – but it was entirely undermined by an offbeat, wacky tone that shifted in and out of focus throughout the film’s runtime. 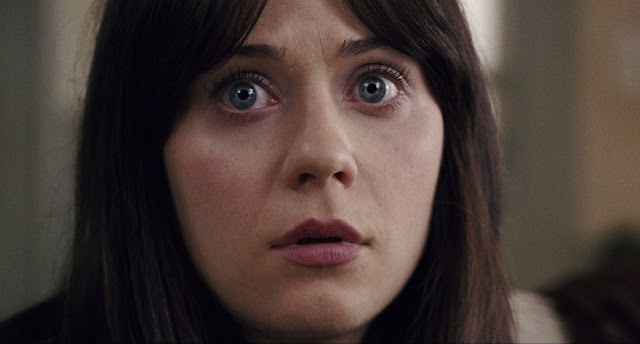 Deschanel spent the majority of the movie with her eyes comically widened, making a bizarre “who me?” face that only confused her characterization and the plot, while Wahlberg aimlessly threw around flat jokes at strange junctures. The result was what I imagine to be an amalgam of the worst parts of a Wes Anderson film mixed with the worst parts of Hitchcock. In short, the tone was totally off. Looking farther back, I’m inclined to believe tone may have been an issue for The Village and Lady in the Water as well, though I remember those films even less clearly than I do The Happening. But all three of those films seem to suffer in part due to an overly serious tone, muddied by sporadic bouts of off-the-wall goofiness. The uncomfortable, occasionally laughable portrayal of Adrien Brody’s mentally challenged character in The Village, for example. And Lady in the Water, while touching (Giamatti’s sweet performance is ever a knife to my heart), was always teetering on the verge of saccharine, even twee, with its cast full of quirky misfits. It just didn’t quite work. McAvoy as the eerily calm alter, "Patricia." The Visit, however, seems to be where Shyamalan began to get his groove back. This film did a laudable job of mixing primal, visceral horror (body horror, psych horror, bio horror) with the darkest of humor, and Split takes that even further, and improves on it in some ways. So rarely have I experienced a horror film like Split, in which I so consistently found myself laughing out loud while simultaneously feeling deeply unsettled, anxious, or scared. The Visit was wall-to-wall oddball horror that had me laughing as much as shrieking; Split is something more nuanced, more fleshed-out, and more disturbing altogether. 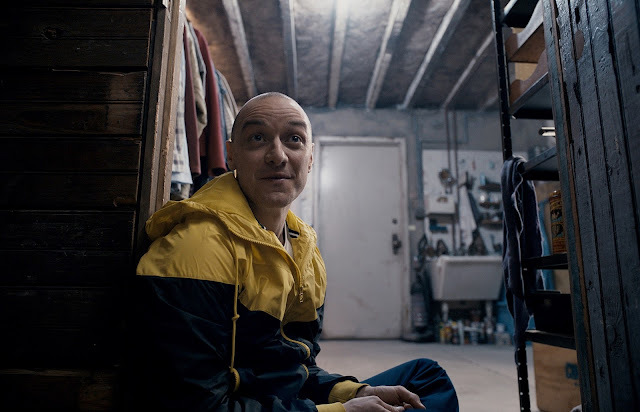 In Split, Shyamalan maintains an uncanny sense that something is not quite right in this world (beyond the obvious mental health issues), which fills every single scene with a sense of impending doom that stretches on and on as your nerves fray further. 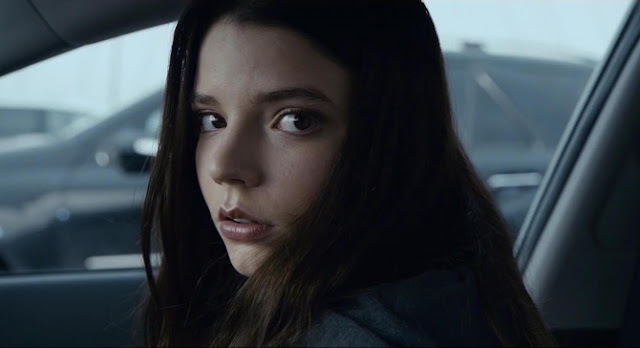 One minute you’re laughing at James McAvoy’s silly, innocent portrayal of a nine-year-old alter, while the next minute you’re confronted with the wide, sad eyes of Anya Taylor-Joy as the terrified abducted, looking on. 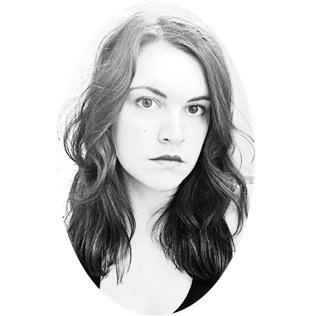 We may initially laugh at McAvoy, now attired in a skirt and shawl and speaking in a high, feminine voice, but it only takes moments to realize that this new alter may be one of the most quietly dangerous of all. You’re constantly drawn into McAvoy’s creepily charismatic, often amusing presence, and then pulled back to the perspectives of the traumatized characters he seeks to harm grievously. Taylor-Joy does wide-eyed terror right. The film has its faults, and although this isn’t exactly a review, I’ll quickly list just a couple: 1) The film is populated with characters doing typically horror-movie-stupid stuff several times too often (honestly, I haven't felt the need to judge characters' actions so harshly in quite some time, and I watch a lot of horror); and 2) I’d love for Shyamalan to explain to me why it was necessary – really necessary – to strip the teenaged girls down to their underwear for a large portion of the movie. Dennis has OCD, sure, but he also seems to have a hell of a lot of extra clothes lying around his place. He couldn't have lent the girls some sweats? 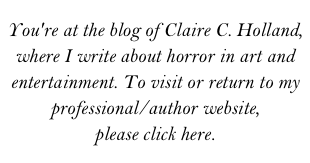 Much of the horror film industry has moved past these clichés, and I think we could all endeavor to do so. But don’t let that distract from the larger point. Split walks a tightrope of restless suspense that I suspect will be highly enjoyable for the adrenaline junkies of horror fandom, and is roundly fun entertainment. That’s far more than I could’ve said about a Shyamalan film just a few years ago. So what did you think? Let me know here in the comments or over on Twitter! Thanks for your comment! I think that's a valid perspective, and something I'd be interested in exploring in more depth in the future.